Last Autumn a link appeared in VegNews sending readers to my photograph of this yummy roasted vegetable tart by Robin Robertson. At that time Quick-Fix Vegan was still being tested and I was not able to share Robin's recipe. A year later people are still arriving on my blog from this link so I asked Robin if she would share her recipe and she graciously agreed. I am pleased to share this tasty recipe with you here and urge you to check out the book whence it came. As a lucky tester of Quick-Fix Vegan I can certainly attest that Robin, as always, provides fantastic recipes that are a snap to prepare and are as creative and varied as they are delicious. Enjoy! This simple and delicious tart can be assembled quickly ahead of time, and then baked when ready to serve. 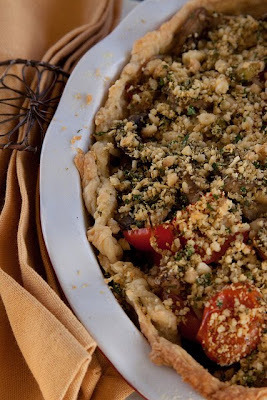 With its flaky brown crust and colorful vegetables looks more time-consuming than it is. A creamy white bean layer binds it all together and adds protein for a lovely main dish. A crisp green salad completes the meal. From Quick-Fix Vegan by Robin Robertson © 2011. Published by Andrews McMeel Publishing. Preheat the oven to 400°F. Press the pastry sheet into a 9-inch tart pan or pie plate, crimping and trimming the edges to fit. Pierce the bottom of the pastry with a fork and bake until golden, 10 to 12 minutes. Set aside to cool. Lightly oil a large shallow baking dish. Reduce the oven temperature to 375°F. While the crust is baking, heat the oil in a large skillet over medium-high heat. Add the zucchini, mushrooms, scallions, and garlic. Cook, stirring, until softened, about 4 minutes. Add the tomatoes, bell pepper, basil, marjoram, salt and pepper. Stir to mix well, then remove from the heat. Mash the white beans, vinegar, and capers in a bowl. Stir in the parsley and nutritional yeast, and mix well to combine. Spread the bean mixture in the bottom of the reserved crust. Spread the reserved vegetables evenly over the bean mixture, then sprinkle the top with the pine nuts. Bake until the vegetables are hot and the crust is nicely browned, 15 to 20 minutes. Serve hot. Mmm, I like the look of this tart! Thanks for posting the recipe. Looks wonderful! I love Robin, she's amazing. So glad she let you post the recipe! I'll have to add this link to my Thanksgiving round-up!! Your pictures are amazing! I wish I had this kind of skill, Just me and my iPhone. I'd love to feature any of your posts on VBU! Hi, my name is Lidia, I run Vegan Bloggers Unite! Just saw you signed up for VeganMoFo. I did too under my other blog Air Eater. VBU! is a collection of blog posts I re-post to share with other vegans. If you're interested I'd love to have you. Here's a link on how to submit your HTML etc. I live in The Garden State with my husband, three beautiful boys & assorted furry family members. 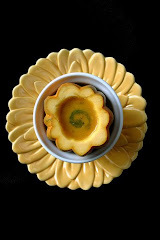 My photographs have appeared in cookbooks, magazines and newspapers. I love photographing, styling, and developing vegan recipes and am available to do all of these things for your cookbook, magazine or blog! Please contact me at LoriMaffei@gmail.com. This is a Flickr badge showing items in a set called Vegetarian & Vegan Food Photography. Make your own badge here.